Thousands of workers of the Mahalla Textile Company held a strike today demanding better wages. 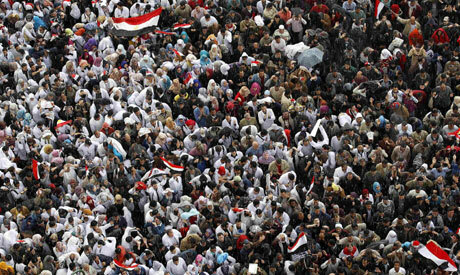 According to the Center for Trade Union & Workers’ Services (CTUWS), 24,000 workers took part in the protest. The workers from the morning shift had joined their colleagues from the night shift and gathered this morning in front of the company’s headquarters, where they announced their strike. The workers chanted against the increasing prices, says the CTUWS. They also announced their solidarity with the pro-democracy protesters who have been camping in Tahrir Square. The company management had locked the gates of the factory to stop the employees from either entering or leaving the grounds. The strike was one of many held throughout Egypt today with employees in different sectors demanding rights encompassing better wages, bonuses, health insurance, equality at work and proper contracts. Clashes erupted between workers at the Military Production factories 45 and 54 and the police after they announced that they will hold a strike this morning. When the minister of military production responded by declaring the day an official holiday, angry workers went into the street where they clashed with riot police. Yesterday, factories 36 and 63 went on strike as workers demanded proper contracts, bonuses and other professional considerations. The Public Transport Authority headquarters witnessed a strike by its drivers. The strike, against low wages and the authority’s refusal to dispense bonuses, began early today. The drivers announced that they were protesting in solidarity with the Egyptian revolt, and that they have been denied their rights for the past 30 years. In Giza, hundreds of young women and men held a protest in front of the Giza governorate’s office, asking for housing units. The governorate had previously announced the allocation of housing units for the area’s youth, but many of those who applied found that none were available. During today's protest, some protesters climbed over the wall of the governorate to obtain applications for the units. In Assiut 7,000 Assiut University employees protested, expressing their anger at not working under proper contracts, and their meagre wages. The protesters demanded that they be given the same rights as the permanent employees. Some of the hospitals workers complained that they earned as little as LE170, even after working there for 15 years, rejecting claims by the head of the hospital that employees earn no less than LE800. Staying in Assiut, 200 employees of the Assiut Petrol Company continued their protest from yesterday in front of the company’s headquarters, where the employees spent the night. The protesters have insisted that they won’t move until they are given proper contracts. In Ismailia, employees of the Suez Canal University, Petrotrade and the general hospitals demanded better work conditions and proper contracts. In the south of Egypt, Aswan saw a high security presence as 300 employees of the Development and Agricultural Credit Bank protested against corruption. The employees demanded the same terms as those who work in the bank's other branches. Back in Cairo, 700 Mukattam Hospital employees, including doctors and nurses, held a protest demanding better wages and proper job contracts. In the governorate of Qena, 200 employees of Siyanco went on strike for the day, demanding that financial guidelines be implemented, equality for all who work in the petrol sector and that the company affiliates itself with the Petrol Syndicate. Later today, several of Egypt’s actors are expected to hold a protest in their syndicate at 5:30 pm to demand the ouster of its head, Ashraf Zaki and that the general prosecutor launches an investigation on his conduct. The protest, announced on the group’s Facebook page, is calling for an investigation into the money donated by businessmen and leaders of several Arab countries to the victims of the Beni Soueif theatre fire in 2007. The actors organizing the protest claim that the money disappeared, never to reach its intended recipients. The group also plans to express their anger at Zaki's negative about towards the revolt and the youth who planned it. They want him to provide them with documents detailing his financial situation before becoming attaining his syndicate position. In Ain Shams hospital, 1000 employees also protested demanding better wages and proper contracts and health insurance for hospital staff. Back in Tahrir Square, a group of lawyers marched from Abdeen Square in downtown Cairo to join the protesters in Tahrir. Earlier in the day, 5000 doctors, hospital staff and medical students held a march from the Qasr El-Aini Hospital to Tahrir Square. EgyptTelecom, one of the country’s largest telecommunications companies also saw widespread protests in front of its various headquarters throughout the country for the last two days. Today the protests dwindled, but continue in front of the Ramses headquarters. The number of protesters has shrunk from 3,500 yesterday to 350. The workers are calling for proper contracts and better wages. Wednesday had seen a spate of strikes in Kafr El-Zaiat, Menoufeia and the Suez Canal zone.